(PhysOrg.com) -- An ancient South American civilisation which disappeared around 1,500 years ago helped to cause its own demise by damaging the fragile ecosystem that held it in place, a study has found. Archaeologists examining the remains of the Nasca, who once flourished in the valleys of south coastal Peru, have uncovered a sequence of human-induced events which led to their "catastrophic" collapse around 500 AD. The Nasca are probably best known for the famous "Nazca Lines", giant geoglyphs which they left etched into the surface of the vast, empty desert plain that lies between the Peruvian towns of Nazca and Palpa. The depictions have spawned various wild theories, including that they were created by aliens. Most scholars now believe that they were sacred pathways which Nasca people followed during the course of their ancient rituals. Other aspects of Nasca history and culture remain less clearly understood, however. In particular, experts have struggled to explain why a society which clearly prospered during the first half of the first Millennium AD then collapsed into a bloody resource war and eventually vanished. Some have argued that a mega-El Niño, which hit the region at around that time, may have been the cause. Writing in the journal Latin American Antiquity, however, a team of researchers led by Dr. David Beresford-Jones from the McDonald Institute for Archaeological Research at Cambridge University, suggest that the Nasca inadvertently wrought their own demise. Using plant remains gathered in the lower Ica Valley, the team found evidence that over the course of many generations, the Nasca cleared areas of forest to make way for their own agriculture. Studies of pollen samples taken by co-researcher Alex Chepstow-Lusty, of the French Institute of Andean Studies in Lima, showed that the huarango tree, which once covered what is now a desert area, was gradually replaced by crops such as cotton and maize. As the paper explains, however, the huarango was more than just a tree - it was a crucial part of the desert's fragile ecosystem, which enhanced soil fertility and moisture and helped to hold the Nasca's narrow, vulnerable irrigation channels in place. Eventually, they cut down so many trees that they reached a tipping point at which the arid ecosystem was irreversibly damaged. The authors do not dispute that a major, El Niño-style event then occurred - finding hard evidence for this for the first time. But they also find that the impact of this flood would have been far less devastating had the forests which protected the delicate desert ecology still been there. "These were very particular forests," Dr. Beresford-Jones said. "The huarango is a remarkable nitrogen-fixing tree and it was an important source of food, forage, timber and fuel for the local people. Furthermore, it is the ecological 'keystone' species in this desert zone, enhancing soil fertility and moisture, ameliorating desert extremes in the microclimate beneath its canopy and underpinning the floodplain with one of the deepest root systems of any tree known. "In time, gradual woodland clearance crossed an ecological threshold - sharply defined in such desert environments - exposing the landscape to the region's extraordinary desert winds and the effects of El Niño floods." In the absence of huarango cover, when El Niño did strike, the river down-cut into its floodplain, Nasca irrigation systems were damaged and the area became unworkable for agriculture. This fits with other evidence that shows that the generations that came afterwards did not fare as well as their predecessors: infant mortality rose, while average adult life expectancy fell. The crops cultivated by their ancestors disappeared in the lower Ica Valley and the area was probably afflicted by a severe drought. The study's authors say that their work contradicts a popular view that Native American peoples always lived in harmony with their environment until the Spanish Conquest. Perhaps more importantly, however, their research also stresses the importance of huarango woodlands for sustaining livelihoods and creating fertile areas in these environments. There are now no undisturbed ecosystems in the region and what remains of the old-growth huarango forests is being destroyed in illegal charcoal-burning operations. 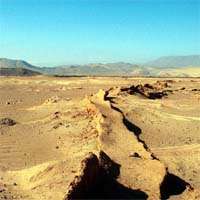 "The mistakes of prehistory offer us important lessons for our management of fragile, arid areas in the present," co-author Oliver Whaley of the Royal Botanic Gardens, Kew, added. "...the river down-cut into its floodplain,"
Back to the aliens theory. I refer to the unusual dolicocephaloid tribes of the Inca (2 out of the 3) and naturally of course to the Nazca markings. I met a Peruvian archeoligical historian who has studied them first hand, and she insists that the markings were gauged and carved using industrial machinery. She maintains that they could not have been made any other way. They are obviously signposts intended to be seen from the air. Perhaps the demise of a culture at odds with its environment is the result of a transplantation of a people into an area not quite in keeping with its natural habitat. I met a Peruvian archeoligical historian who has studied them first hand, and she insists that the markings were gauged and carved using industrial machinery. She maintains that they could not have been made any other way. And I can not understand how people could have eaten before the creation of McDonald's. It's absurd to think that such primitive pre-McDonald's people could have provided their own sustenance. It's much more likely that McDonald's developed time travel technology and amassed their great wealth by selling food to prehistoric people. They are obviously signposts intended to be seen from the air. The golden arches are obviously time travel doors through which McDonald's employees could deliver food to the past. I hate to be mean, but there are equal evidence for both "theories"... and you ruffled my feather when you called the aliens idea a theory. the concern is that this could happen to us again now. maybe on a global level. Maybe the mysterious lines were like our apollo space program. perhaps they achieved rudimentary flight with balloons or other advanced methods that turned out to be economically just trophy enterprises and could not be sustained when the GDP finally collapsed as a result of the unsustainable society practices such as clear cutting.